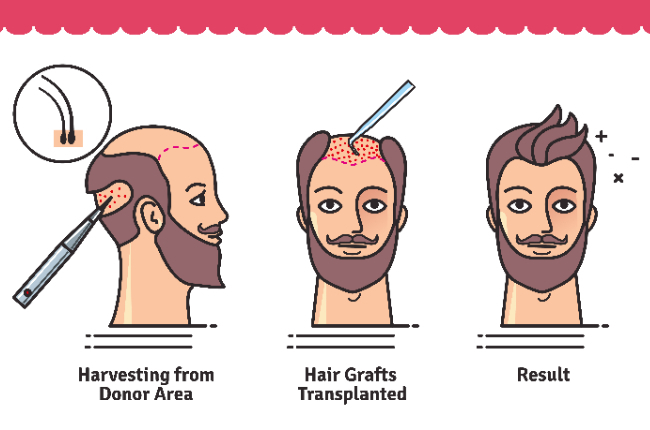 Hair transplantation is a daycare procedure done under local anesthesia.It involves simply translocating individual hair follicles from a part of the body called the 'donor site' (generally the back of the scalp)to a bald or balding part of the body known as the 'recipient site'. The more density of hair at the donor site, the better the results will be. The hair at the back and sides of the scalp is usually thicker, stronger, more densely packed and independant of hormonal control and therefore makes ideal grafting material. The choosen method of Hair Transplant is FUE or follicular unit extraction. The recipient area is marked accurately.The donor area is shaved and cleansed. Local anesthetic is then injected into the donor area to completely numb it. Then hair is harvested from the donor areas by a motorised punch in a direction parallel to the direction of hair. This step is extremely important to have a good viable yield. Depending on the density of hair in the donor area, we can harvest upto 5000 hair in each session. At this juncture the patient is given a break. During this time, the technicians are busy separating the donor hair, selecting the most dense follicles and keeping them viable. The recipient area is then numbed with anesthetic injection after all the follicle harvesting and separating is completed. The motorised punch is then used to create zones for the donor hair implantation.The extracted hair follicles are then reimplanted in the recipient area in alignment with the existing hair in that area so as to achieve a natural result. When all the donor hairs have been transplanted the treatment is complete. The patient can leave the clinic with a list of post operative instructions. Patients will be able to see the outline of their new hairline immediately following treatment and the hair will continue to grow. Within the first few weeks following a transplant most of the newly transplanted hair will fall out. The hair then enters a resting phase. The new hair will begin to grow some 3 to 4 months thereafter. It takes at least 9-12 months to see the full results of your transplant. The new transplanted hair can be trimmed, colored and styled the way one likes it. When done by an expert, almost 80 % of the transplanted hair remains viable.